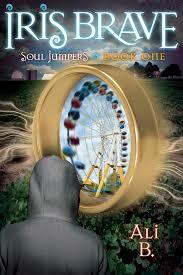 Iris Brave (Soul Jumpers, 1), by Ali B.
I like to give authors a chance to tell us about their new releases, even if I don’t get an opportunity to read and review them myself. Here’s a clean new read by author Ali B.
Iris Brave isn’t as courageous as her name suggests. That’s about to change. Iris doesn’t take risks. Heights make her dizzy and she prefers to swim in the shallow end… with nose plugs. On a summer visit to her grandpa’s farm, a mysterious stranger shadows Iris, leaving her cryptic messages. When this outsider turns out be a phantom from her family’s past, Iris sheds her timid ways to uncover the truth and protect the family she loves. Along the way Iris discovers family secrets and enigmatic figures that lead her to question everything she’s ever thought was real. Or visit Ali at her website. The story sounds engaging. Like how she lets go of fear and finds an inner strength. Important message for kids. That’s what I thought, Pat.